Australia to host Belarus in the stage of the final four teams. Ashleigh Barty was unstoppable for Australia. 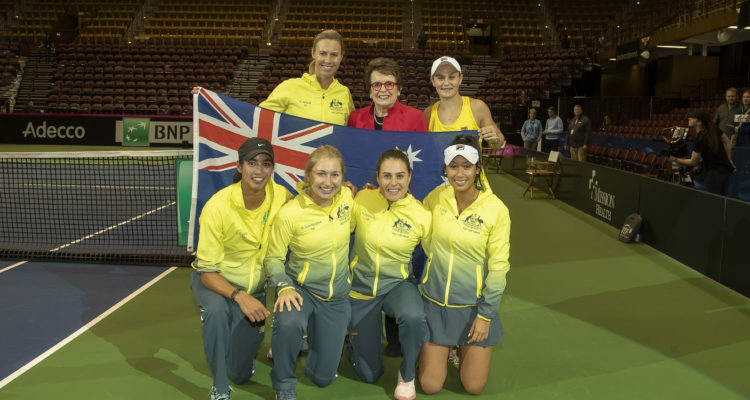 Her three points in three rubbers over the weekend lifted the visiting Aussies to a 3-2 victory over the United States and into the Fed Cup by BNP Paribas semifinals. On Sunday, the Australian No. 1 won twice – in both singles and doubles – to lift her country into the semifinal round for the first time since 2014. The 18-time Fed Cup champion Americans received enthusiastic support and backing from the sellout crowd inside U.S. Cellular Arena in Asheville, North Carolina. They rallied behind the 2018 Fed Cup finalists following Barty’s suprisingly easy 6-4, 6-1 win against No. 17 Madison Keys that lasted only 66 minutes and put Australia ahead 2-1. The World No. 13 Barty overcame a double service break early in the first set, which put her behind 0-3, by breaking Keys four times. Then, she broke the American No. 1 three more times in the final set. Although Barty hit just seven winners, she kept her unforced errors down to a respectable 13 while forcing Keys into 31 hitting mistakes and 24 additional unforced errors. She outpointed Keys 67-45. Following Barty’s 11th consecutive Fed Cup win, U.S. team captain Kathy Rinaldi inserted Australian Open semifinalist Danielle Collins into the Team USA lineup in the fourth rubber in place of Sofia Kenin, who had lost to Barty on Saturday. The No. 23 Collins lifted her team’s and the crowd’s spirits with a crucial 6-1, 3-6, 6-2 win over No. 47 Daria Gavrilova, who substituted for No. 157 Kimberly Birrell. With the tie even at 2-all, it came down to a deciding fifth rubber doubles, in which the reigning U.S. Open champion Barty and Priscilla Hon in her Fed Cup debut, replacing Gavrilova, were clutch in beating Collins and Nicole Melichar, 6-4, 7-5. After being broken in her two previous service games, Hon held her serve at love as she and Barty won 12 of the final 14 points in the rubber to advance Australia against Belarus. The Aussies broke Collins’ serve in the 11th game of the final set on a second break-point opportunity to push ahead 6-5 and never looked back.  Australia have done it! At Team USA’s post-match press conference, Rinaldi defended her decision to keep Collins in the American doubles lineup after enduring a one hour and 57 minute singles rubber. “We saw her fight. We wanted to ride that momentum,” she said. “We just saw how well she was striking that ball, so we went with her. Next, the United States will play in the World Group playoffs in April. A win will return Team USA to the World Group next year, while a loss would relegate them to World Group II. Indeed, at age 24, Gavrilova is the oldest player in Australia’s lineup. Barty is 22 and Hon and Birrell are both 20. Additionally, fifth member Astra Sharma, who didn’t play against the United States, is only 23. • With Australia’s victory, it meant that all four first-round away teams – Australia, Belarus, France and Romania – won to advance to April’s World Group semifinals. • The 2019 Fed Cup by BNP Paribas World Group and World Group II playoffs draw will be streamed live from the ITF headquarters in London beginning at 12:00 GMT on Tuesday, Feb. 12. This entry was posted in Fed Cup and tagged Ashleigh Barty, Australia, Fed Cup, United States.